I am always o the lookout for low sugar and possibly gluten free breakfast ideas, and if you read my “4 common mistakes healthy people do” you might know that many of the pre-prepared cereals or muesli option on the market, (yes even some of those yummy and super-expensive cereals that you can find in Wholefoods) do actually contain a lot of sugar. This gluten-free nutrients -rich breakfast recipe, is perfect to use up any quinoa leftover, and it is a nice and delicious change for a lower sugar cereals alternative. The turmeric is considered to have anti-inflammatory properties, while quinoa is gluten-free, contains a full spectrum of essential amino-acids, which is rare in the vegetables world, and it is considered a superfood due to its high content of vitamins and minerals. Simply put all the ingredients in a bowl, and enjoy! 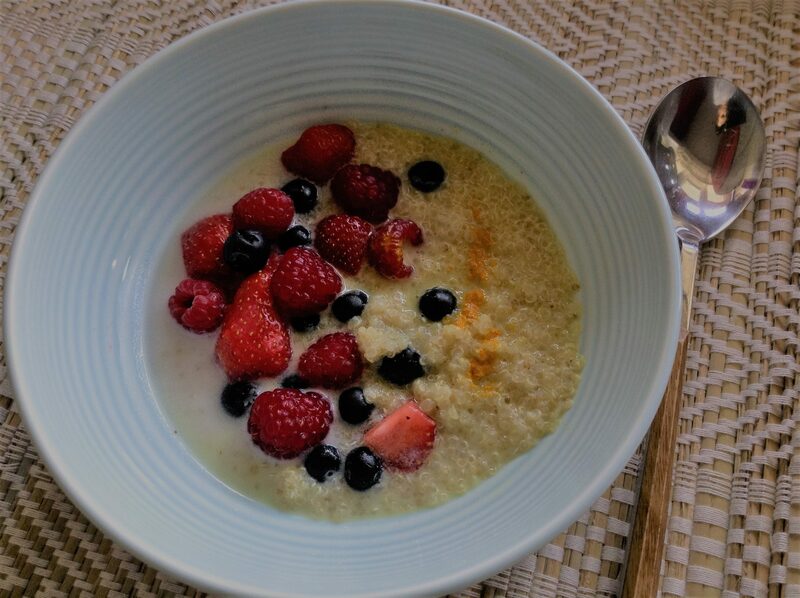 Also for some healthy tips on how to easily lower the sugar content of your diet, and healthy breakfast tips, please check out our article 4 common mistakes healthy people do . For more info about the healthiest almond milk choices stay tuned for my next blog post “almond milk, my pick of the best”.